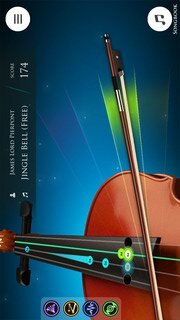 Violin : Magical Bow is a beautiful, fun, free and " real " Violin app. It will help you play any Violin song right on your phone, with a simulated bow on the screen. Play With Notes: press notes on Fingerboard, you can select a Violin Scales to free-play or select a songs and follow the learning guides. Have Fun With Violin: Play a long with Violin bow like a real Violinist with songs in the Game Mode. Play With Chords: Using violin bow to play hundred chords in the Chords Library.